How will scoliosis affect my pregnancy? Will carrying and having a baby increase my curve? Recognizing a lack of generally-available information, we looked to the published research on this topic to learn the facts behind potential scoliosis pregnancy complications. Previously, we wrote about the common questions and answers surrounding scoliosis and pregnancy. This blog post generated over 100 comments from people around the world wanting to know more about how scoliosis might affect their labor, delivery and child. We were also contacted by Romper and interviewed for an article in their online magazine on the topic of scoliosis and pregnancy. All of this told us that it’s time to dive a bit deeper into the topic. We looked at four research articles on scoliosis in pregnant women to see what they could tell us about scoliosis pregnancy complications. This study from the European Spine Journal is the most recent research article published on the topic of scoliosis pregnancy complications. It reviewed 22 articles published between 1980 and 2015 and found that women who were diagnosed with scoliosis during their teenage years were slightly less likely to have given birth. These women were also slightly more likely to have undergone treatment for infertility. Among those women with scoliosis who did give birth, their chances of experiencing back pain were slightly higher. In those women who experienced back pain, the severity of their pain may have been slightly more severe, although it did not cause any disability or severe limitations in activity. There was also a slightly increased risk of their scoliosis getting worse during or after their pregnancy. However, it’s important to emphasize that all of these associations were not found to be very strong. The authors also noted that, with modern technology, most women with scoliosis do not experience any complications related to the use of anesthetic or epidurals. As one of the most concerning scoliosis pregnancy complications, this finding is particularly heartening for many women. Although, the study does recognize the need for more research in this area before strong conclusions can be drawn. 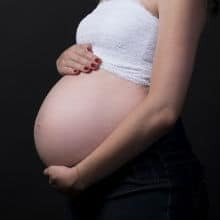 This article, like many others, begins by recognizing the limited number of scientific studies on the topic of scoliosis pregnancy complications, as well as by noting that many of these findings are contradictory. For instance, some studies find no increased risk of scoliosis progression during pregnancy, while others have found a significant risk. This phenomenon is quite common in scientific research and the reason numerous studies are necessary before strong conclusions can safely be drawn. Variations in the population of patients being studied, how they were recruited, the methods used to analyze the results, and many other factors can all influence the conclusions drawn by the authors. In this study, they found that in 70 out of 71 pregnancies, there were no problems with epidurals, even in patients with lumbar spinal fusions. Anesthesiologists only refused to perform an epidural due to the presence of scoliosis three times throughout the duration of the study. They found no significant change in the scoliosis after pregnancy. However, of the 59 patients in the study, only 11 were x-rayed after the pregnancy to see what effect it had on their scoliosis. It is not known if the other 48 patients did indeed experience worsening in their scoliosis or not. So, while this study provides encouraging evidence that epidurals can safely be performed in the majority of patients with scoliosis, it’s probably not the best source of evidence regarding whether or not scoliosis gets worse during pregnancy. This study looked at the incidence of epidurals, low back pain, depression, and sexual dysfunction. It compares women with scoliosis who underwent spinal fusion surgery and healthy women without scoliosis. In the study, anesthesiologists refused to perform epidurals on a large number of post-surgical scoliosis patients. While the study only involved 17 participants, six of the women who’d undergone scoliosis surgery had severe back pain that required treatment or hospitalization. Furthermore, 13 experienced continued back pain after delivery that significantly impacted their life. None of the healthy women without scoliosis reported similar back pain during or after pregnancy. The women with scoliosis who had undergone surgery also reported increased dissatisfaction with the surgery after their pregnancy. These results illustrate the impact that scoliosis surgery can have on pregnancy and related back pain. While it is certainly possible for women who have had scoliosis surgery to deliver a healthy baby, they are more likely to experience severe back pain during and after their pregnancy. The CLEAR protocols have helped many people who have had scoliosis surgery. If you’ve had scoliosis surgery and are pregnant or considering becoming pregnant, we highly encourage you to schedule a consultation with a CLEAR scoliosis chiropractor to find out what they can do to help reduce or prevent back pain during your pregnancy. Is there a higher risk of birth complications for women with scoliosis? The results of this study indicate that no, having scoliosis does not increase the chances of a difficult birth. They did find that women with scoliosis were more likely to have undergone fertility treatments, to have their labors induced, and to deliver by Cesarean section (C-section). While these procedures have additional risks and potential complications, women with scoliosis did not experience any higher rates of complications from these procedures than women without scoliosis. It’s important to note that having scoliosis does not predict a C-section will be needed. However, someone with scoliosis is 56% more likely to have one. Out of 1,000 pregnant women without scoliosis, there are approximately 300 C-section deliveries. And, out of 1,000 pregnant women with scoliosis, you would expect about 458 to deliver via C-section. Do you have any questions about the research articles above or any other research articles on scoliosis pregnancy complications? Would you like to know more about the scientific evidence for other topics? We’d love to hear from you in the comments below!